Let me start by admitting that I don’t love chocolate or peanut butter. Yes, it is true (please don’t hate me). I don’t dislike chocolate or peanut butter, I just don’t love them. I will gladly devour a decadently rich chocolate cake with pleasure and a simple pb sandwich is comforting and satisfying to me, but I generally do not crave either pb or chocolate. I’m more of a vanilla or fruit flavored kinda gal. 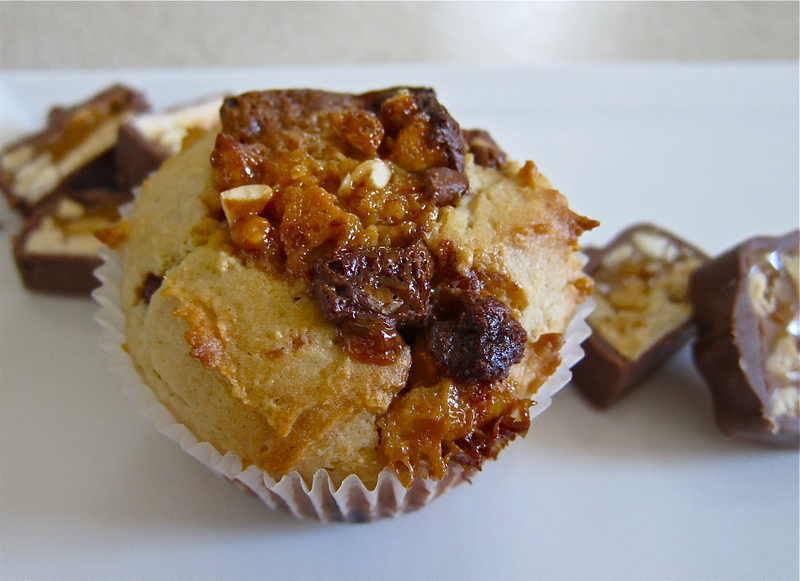 So there I said it, but with that said these snicker and peanut butter muffins were a hunka hunka burnin love! 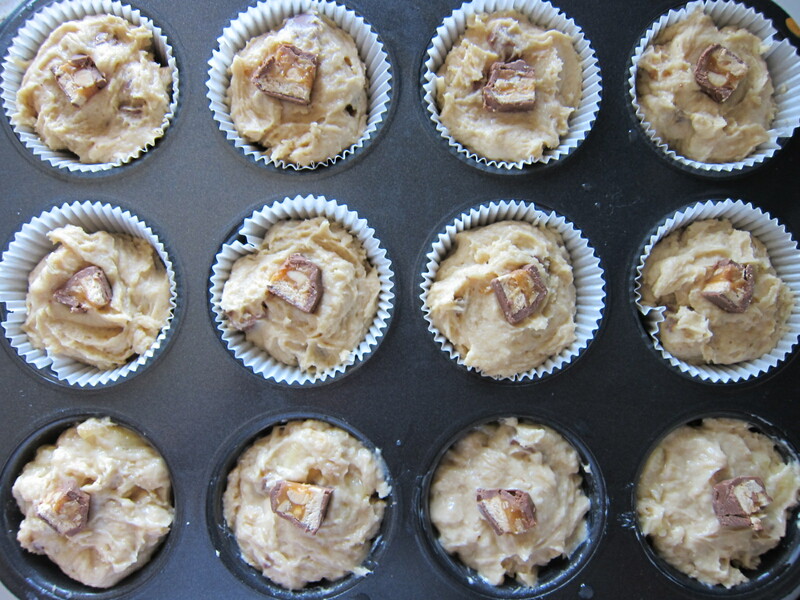 The Snicker and peanut butter muffins surprisingly were not cloyingly sweet. They are feathery and pillowy soft with nice folds of chocolate and peanut butter throughout. They also have a nice nuttiness and crunch from the peanuts. These are not exactly a healthy breakfast treat, but they are completely satisfying. When preparing the muffins the batter may seem a little dense, this is how they are supposed to be. 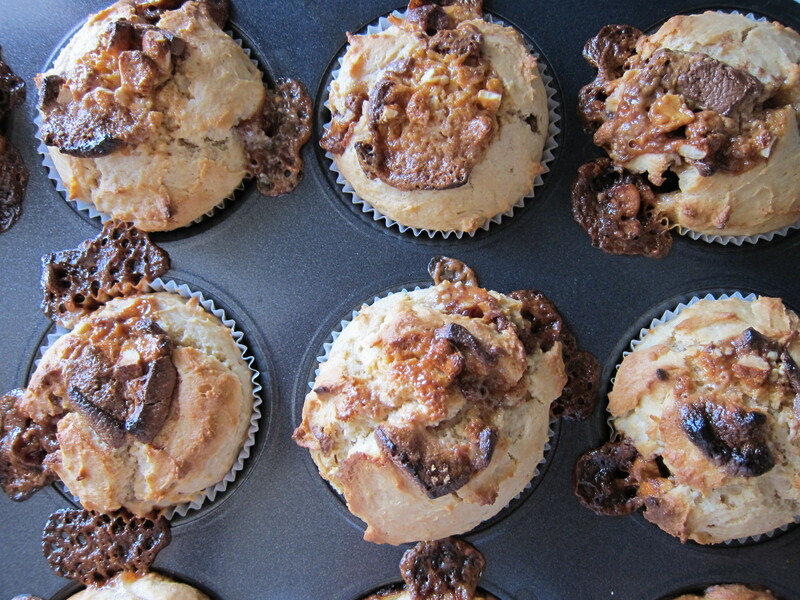 Don’t be surprised when you pull them out of the oven to discover that the Snickers tried to escape, but failed miserably and are strewn across the muffin pan. The slight smell of burning chocolate alarmed me, but all was fine and delicious in the end! I used a little less peanut butter than the recipe required and instead substituted some sour cream in its place. I also experimented a little and made half of these with banana. Ooey gooey ripe bananas were the perfect addition, turning these into the equivalent of an Elvis sandwich in muffin form. That or think chocolate covered frozen banana sprinkled with peanuts turned muffin. Either way you think of it these were fully, light, sweet and delish! Preheat the oven to 400ºF. Stir together flour, sugar, baking powder and salt. Add the peanut butter and mix. Add the melted butter, sour cream and egg to the milk, and then stir this into the bowl. 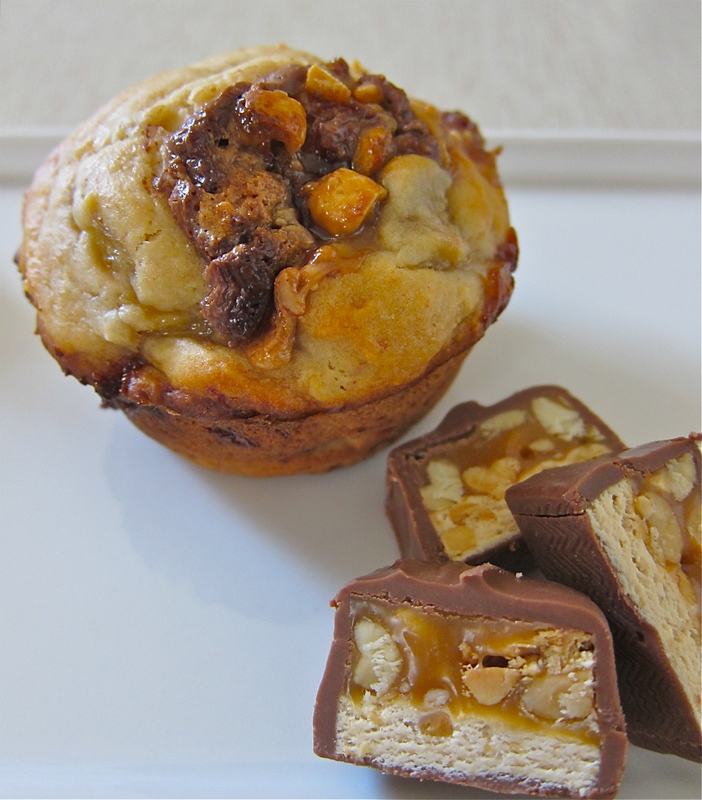 Mix in the Snickers pieces (optional fold in the mashed banana) and spoon into the muffin cups. Bake for 20 to 25 minutes, or until the muffins are fluffy and golden. Let them cool on a wire rack. Stay at Home Chef – it is true! i don’t hate either just prefer other flavors, but this combo was so good. and the sour cream really helped! happy baking! Oh snap. Need. to. make. Misty – Do it! But be sure to add banana! I think bananas would’ve been the extra kick I needed for these muffins. I love your presentation & that you put a little snickers on the top too. Yeesh woman. You are killing me with these! Wonderful recipe. I will definitely have to try and make it one day! Haha, Elvis muffins now! I love your addition of bananas, sure makes them extra moist. Too bad I missed this week but I’m ready this Monday, hope to see you.